I am realizing more every day that the possibilities for God's people, and ministry, are endless. There are SO many things I envision the body of Christ doing to effect change for the Kingdom and in the lives of those who, otherwise, would not know Jesus Christ as the Living Lord and Savior. He is able to do "exceedingly, abundantly, above, all that we can ask or think." (Ephesians 3:20) Thus, my patience is wearing thin for short-sightedness. Those with a cold disposition and faithless attitude have begun to be one of the greatest irritants for me. Who are we to say what God CANNOT do in the life of anyone that has Him on their side? Yeah... I know. It's a feasible yet controversial statement. A statement about the well intentioned dragons that get caught up in the "conceptual" stages about what "should" be done. We've all witnessed those who have a firm grasp on what the problem is and, even more, what should be done about it. However, though they've put their minds and mouths in motion, they never make it into material movement and manifestation. "We SHOULD take ministry beyond the walls of the church." "We SHOULD be more supportive of the pastor, his vision, and his leadership." Or, "what the pastor should have done is this and that." "Back in the day, when we had the previous opportunity, we SHOULD not have proceeded at the time." You see what I mean? A people and place that simply SHOULDS all over itself. The bible says, "I must work the work of Him that has sent me while it is day, for night comes when no man can work." (John 9:4) It would seem as if we are repeatedly, in the word of God, admonished to DO in action rather than in concept. It's not enough to say "I should have given food to the hungry" or "we should have an agency to help abused women and children." I am challenged and convicted to rid myself of the "should" that surrounds me and engage in ministry in an even greater way. Wow... I am preparing for a test, that commences in the morning, for a class called "Psychology of Personality." One of the strongest "theories" we have been wrestling with is that of Sigmund Freud. It's amazing that, though he was a self-proclaimed atheist, much of his overall perspective for humankind had a biblically relevant application. In a nutshell, Freud believed in the basic "badness" of the human race. In his estimation, we are ALL inanimately bad and thus have natural tendencies that gravitate toward an almost evil outcome and destiny. However, he believed that through a set and sequence of pregenital "stages" that one could learn to deal in society to be a functional person by way of healthy or functional advancement through each aforementioned stage. He believed that there were three levels of consciousness: The "id" The "ego" and The "superego." Id being the unconscious level of personality. Id, being driven by the pleasure principle, is an unfiltered and unquenchable force that basically seeks to do what is wanted and not what is politically correct. The superego is the "middle man" that basically tries to convince the id that his desire is understandable but not practical at the time. Thus the superego is fashioned to redirect the energies of the id to wait until there is some socially acceptable time and place to carry out it's driving desires. The ego represents the socially conscious level or echelon of personality existence. The ego has internalized the socially acceptable "means" of societal principles. So... The ego is a place that absorbs what is learned in society to be "morally right" in the eyes of the masses. What parents, church, God, etc has taught serves as the "acceptable" avenue for the id to satisfy it's urge. This is important and amazing. Freud inadvertently substantiated the claims of the Holy Scriptures. Over and over again we see how, through the fall of Adam (subsequently mankind) we are all overcome with the tendency and penalty of sin. David said, in Psalm 51, "I was born into sin and in sin did my mother conceive men." Isaiah said, in Isaiah 6, "for I am a man of unclean lips and I dwell amongst a people of unclean lips." Jesus Himself said, in John 3:18, "whoever believes in Him (Jesus) is NOT condemned, but he who does not believe is condemned ALREADY." Unfortunately, we all have a sin mechanism that is innately healthy WITHOUT the acceptance and sacrifice of our Savior and Lord Jesus Christ. Yes Freud... we ARE innately doomed to a life of evil and condescending tendency withOUT the intervention and intercession of our Lord Jesus Christ. Thank God for the promise in 2 Corinthians 5:17... "if ANY man be in Christ he is a NEW creation, old things are past away BEHOLD, all things are become new." Though Freud ultimately takes a pessimistic approach to the plight and plot of people, thank God there is a great high priest that, according to the Hebrew writer, has offered a new and living way. Thus the Freudian mindset, though having some validity in premise, is ultimately not the last voice on the matter.... Hallelujah!!! In the close to nine years I've been at Friendship, affectionately called "The Ship", there have been many great endeavors to reflect upon. I am grateful that the Lord has allowed me to see some great things. NOW... I am PUMPED about what the Lord is doing in the life of our church now. Our theme for the year is "Our Time to Shine in 2009" (Matt. 5:16). As result, we are attempting to do some bold things in ministry. 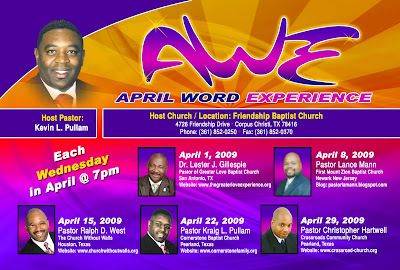 So... We are excited about what we are calling A.W.E..... April Word Experience. Every Wednesday night in April we will have a wonderful worship and word encounter with the Lord. We have some of this country's most gifted preachers/pastors coming to share with our city and congregation. Granted TWO of the guys are my brothers. (Kraig L. Pullam and Lance Mann) None-the-less, they are among two of the nations most up and coming trumpeteers for the Lord. No doubt that this is a HUGE undertaking for a ministry of our size and scope. Nevertheless, I am trusting God as Jehovah Jireh to afford us everything we need for success. We solicit your partnership through prayer. If you are in the South Texas area any Wednesday evening in April, we invite you to come and share in this experience with us. Well folks... It's been a LONG time since I have posted and I have thoroughly missed every minute of the dialogue and fellowship. It will probably take me a couple of weeks to really get back into the swing of things but I am dedicating myself to posting EVERY day. I have continued to read all the posts of my "blogfamily" and you ALL continue to inspire me. I believe it's your dedication to sound biblical exposition, pastoral leadership, and Christian fellowship that makes your blog presence so rewarding and helpful.